Most Overlanders are using a 4 door JKU or similar model. Is there anyone out there who travels with just their 2-door? No trailer? I know that I'm going to have to pack light. My largest items will be a tent and an ARB fridge. I'm installing Goose Gear side panels in order to provide organization and save some space. Electrical will be run into the back area and I've even removed the rear seat belts so they're not in the way. I chose the 2-door because I can't see taking everything and the kitchen sink with me. Anyone care to share storage ideas of how you make this work? Subscribing so I can scavenge some ideas, myself. I purchased a Rigid Jobsite box, for some hard secure storage, however the thing just took up entirely too much space. It was taller than I expected, and deeper (dimensionally) than I wanted. I think I'm going to end up building something out of some plywood to fit behind the front seats, that's wider, shorter, and more shallow for some storage. I've eyed the Goose Gear stuff, but don't see the organizational value compared to it's price. I've also been looking into some kind of basket or shelf to go in the rear at the tail-gate, to offer two levels of storage. Do you have a hard-top, or a soft top? Normally I would balk at the price too, but I justified it by saying that I would have the Jeep for 20 years. Which I probably will. sipde and cdtjk like this. I have a 2 door with a roof top tent, so the bulky bedding can stay in the tent. I removed the back seat of course. Inside is a 50 qt Dometic, and a few bins and tool bags. Everything fits fine. I see you're in Nor Cal; we had a trip near Trinity Lake last weekend. I tried really hard to make everything fit in my 2-door JK, along with me, my wife and our 50 pound dog, but finally gave up, got an off-road trailer and a RTT. But for a couple of years I ran with this rack I got from QT. It worked pretty well, but once we got the ARB 50 fridge we had to make the switch to the trailer. That thing is huge. I’m making a list of what I need to pack. There are a lot of pieces that have to come together if you’re going to be self sufficient away from home for a few weeks. I’m assembling a Goose Gear system now for my 2 door. I can’t do the electrical to the rear yet until I cut a hole in the passenger side panel and buy a coupl3 of batteries and a battery cable to run power from the front to the rear. It is possible to do this in a 2 door though. I’m planning on alternating between spending the night in the tent and staying in a nice hotel. I’m still shooting to be ready by sometime next year. I tried for awhile, but with 2 kids and a wife, I had a trailer built. Used to use a harbor freight hitch mounted cargo basket. What a difference the trailer made! Still haven't got a rtt yet, but we did get a jku. Im listing my tj trailer in the jeep parts non-specific section of classifieds. We got a bigger vehicle and my garage is out of room. It's made specifically with the 2 door jeep's low tow rating in mind. Comes in at 770lbs with tent rack on. 625 without spare and rack. If you do any camping you will appreciate the extra room. Pm if interested. I recently purchased 2 plastic boxes from Walmart that seem ideal. The are a perfect length and height to stack 2 length-wise behind the passenger seat. I've nested three smaller plastic bins with lids that fit perfectly in one of the boxes (kitchen). I put another bin in the other box (tools and recovery). There's still a generous amount of room (basically the same amount of room) on the other side of the Jeep. I currently just have a cooler, but there's room for a fridge. We plan to put our stuff in one duffel each. We'll add a top rack and an RTT. I think we'll be fine with our ground tent, but we'll have "extra" space when we move to that configuration. We're also considering getting a trail rack for over the spare. If we did that, we could move one of the plastic boxes outside. 1999 TJ: 3.5 inch lift Quadratec on Fox, 33x12.5x15 ProComp Xtreme2 MT, Dana 44 front with RCV axle shafts and Dana 44 rear with Superior chromoly axle shafts factory lockers, LoD signature front bumper, rear bumper & tire carrier and rock sliders with Quadratec 11k lbs winch (synthetic), Currie CurrectLync HD steering and upper control arms. Sure it's possible in a 2 door. Look up IAmJake on YouTube, he's been doing it for years. Yep, I've seen Jake and his various adventures. I've not followed him, but I check in every once in a while. I see he's recently picked up a trailer and expanded what "camp" is for him. A trailer is out for me. Modifying the JK is for Overlanding is enough for me. I'm still working on the Goose Gear panels, I'm going to buy the bottom plate for a mounting surface for the ARB refrigerator that I'll be talking along. Right now I'm researching a circuit breaker and a fuse panel to run some additional electrical devices. I found an overhead LED light at Quadratec that will mount where the rear windshield wiper housing is now. Extra light in the back at night would be great. Too bad I didn't do this earlier in life before a house and a job and saving up for retirement were priorities. You're a few episodes behind. Trailer came and went and as of right now Jade is being stretched quite a bit. 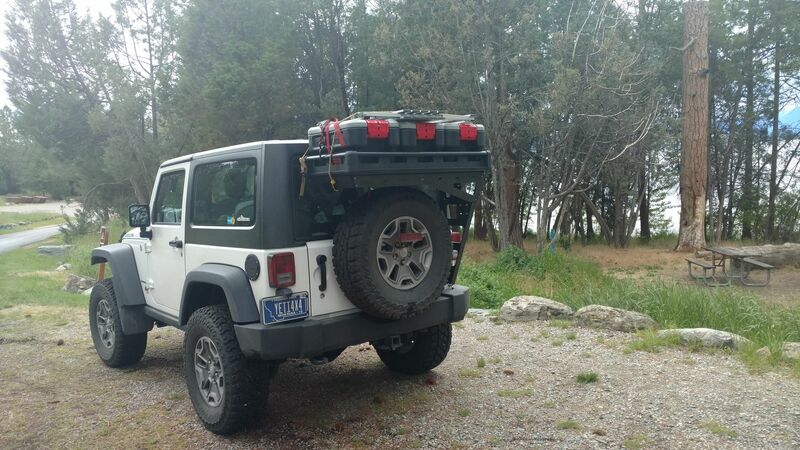 For those of you without a trailer, have you come close to exceeding the gross vehicle weight of your Jeep?